Schwartz, the third Time Jacker, freezes Uhr and Ora and comments on their initial failures and saying it’s his turn to put a stop to Oma Zi-O’s rise. 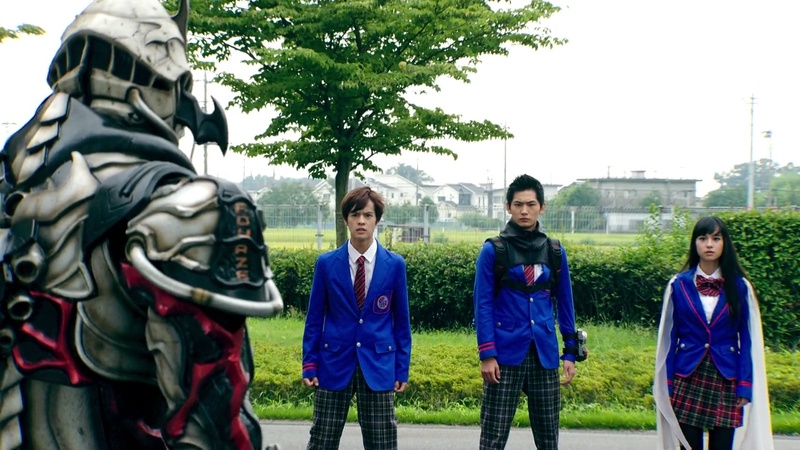 On the way home from school, Sougo overhears two of his classmates and wonders if Tsukuyomi and Geiz can be considered his friends. Arriving at the shop, Uncle Junichiro reluctantly accepts a job fixing an audio system with a clock component. Sougo asks why he accepts jobs he doesn’t want to, but Uncle Junichiro just says he likes to repair clocks. Tsukuyomi and Geiz are about to head out to investigate another Another Rider, but Sougo asks them to wait up so he can come with. Tsukuyomi and Geiz explain that multiple 18-year-old Libra high school girls from Amanogawa High have disappeared over the years. Sougo notes that Another Build and Ex-Aid targeted people with the same traits as well. They head to Amanogawa after Tsukuyomi received a missing persons flyer from a young man (Gentaro) about a missing girl from the school who fits the profile. They change into Amanogawa uniforms so they can go undercover and snoop around for 18-year-old Libra girls. They have no luck just asking around though so Sougo has a plan. He throws himself down the stairs so they can distract the nurse and Tsukuyomi and Geiz can search through the student records. They find one student, Yamabuki Karin, who is an 18-year-old Libra. The nurse tells Sougo he’s okay. Just then, Sougo catches Karin who appears ill. She looks at Sougo and then runs away. 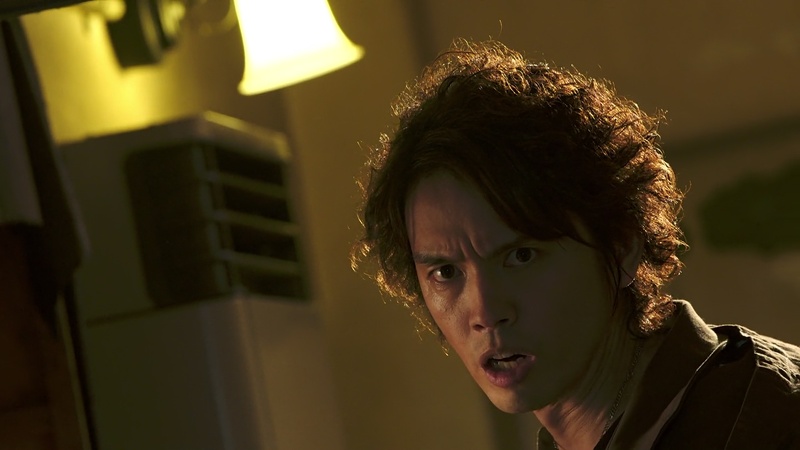 Karin heads to the rooftop and is attacked by a hooded man… Kusaka Masato, who hurls her off the roof. But Karin is saved by Another Fourze and taken safely to the ground. Sougo, Geiz and Tsukuyomi hurry over. Sougo and Geiz henshin and battle Another Fourze. Another Fourze uses Chain Array to swat Sougo into the wall, causing the Build Watch to fall to the ground. 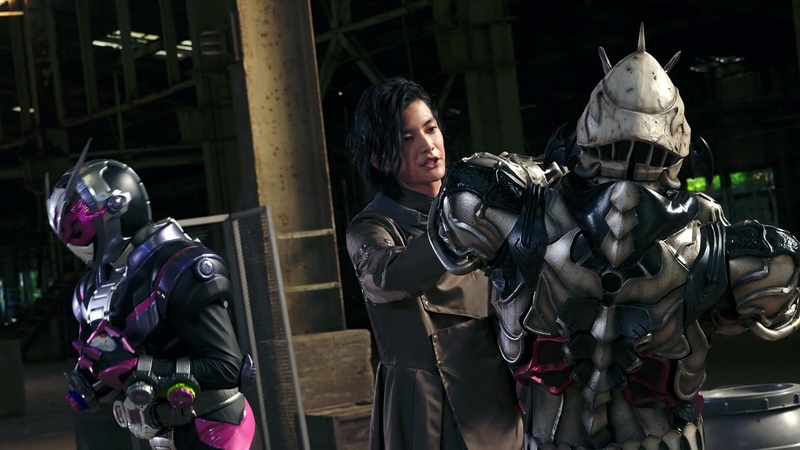 Geiz picks it up and uses it to get Build Armor. He delivers a Vortec Time Burst to drive Another Fourze back. But Karin runs over and grabs him. Another Fourze shoves her to the ground and leaves. They try to explain to Karin that they are here to protect her, but she runs away. Two Amanogawa students, Daita and Chikao, stop them from chasing after Karin as they are members of the Kamen Rider Club and are excited to see real life Kamen Riders. They invite them to their club room where there are photos of the original Kamen Rider Club on the wall. Sougo sees “Ryusei” on one of the photos and remembers Woz’s “shooting star” clue. 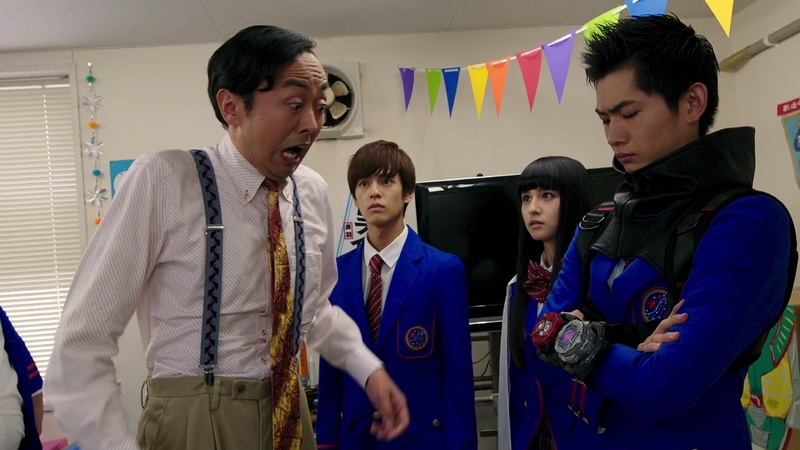 Geiz and Tsukuyomi tell Sougo not to believe everything Woz says. Sougo still thinks it might help and he asks Daita and Chikao about Ryusei. They explain Ryusei joined the KRC after transferring here in 2011. Geiz remembers seeing the 2011 on Another Fourze. Ohsugi-sensei walks in and welcomes the new KRC members as their new friends. Daita and Chikao tells him that they are Kamen Riders. Ohsugi sees the Watches on Geiz’s arm and hurries over to open a lockbox (which also contains a pic of Sonoda-sensei) with the Fourze Watch in it. He hands it to them and says the previous KRC advisor (Gentaro) asked him to give the Watch to a pair of amazing guys that’ll appear. Ohsugi believes they are those amazing guys. Tsukuyomi researches the missing girls and find they’re all from 2011. Sougo suggests they find the first girl that went missing in order to catch Another Fourze. Sougo and Geiz head back to 2011 while Tsukuyomi stays to watch over Karin. In 2011, a young man, Sakuma, has a young high school girl in an abandoned building. But he is frustrated to discover his power is fading. 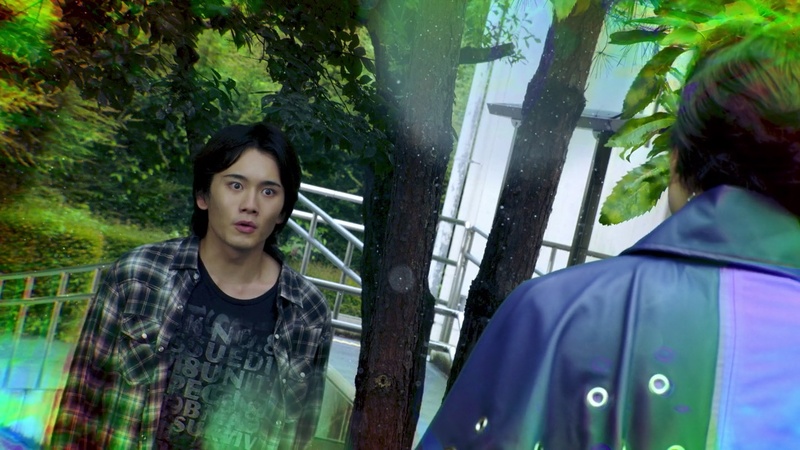 He heads outside and comes across Fourze fighting a Zodiarts. Schwartz appears and Sakuma is more than willing to accept being part of an experiment if it gives him power. 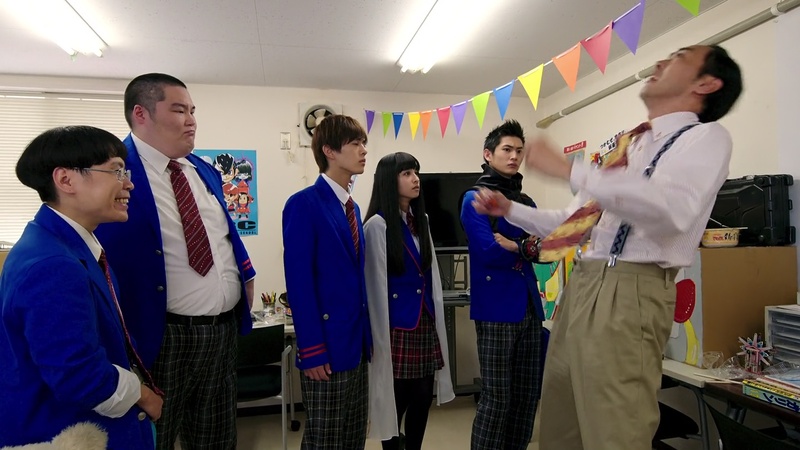 Schwartz shoves the Watch into Schwartz and he becomes Another Fourze. 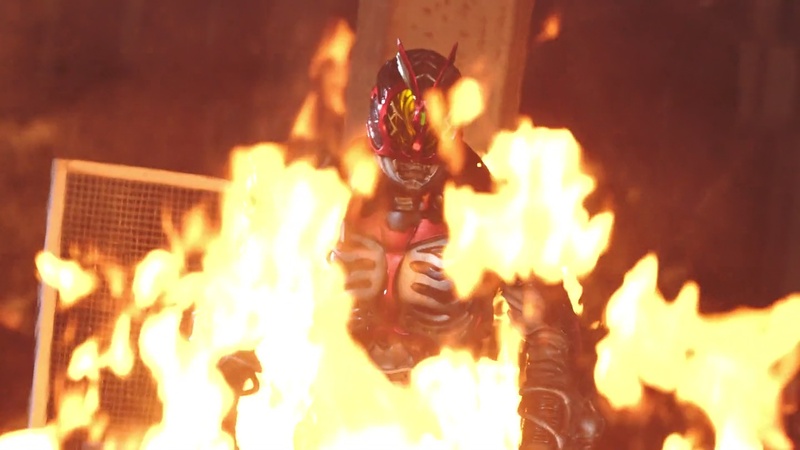 That forces Gentaro to dehenshin and the Zodiarts to disappear with Sakuma now Fourze. 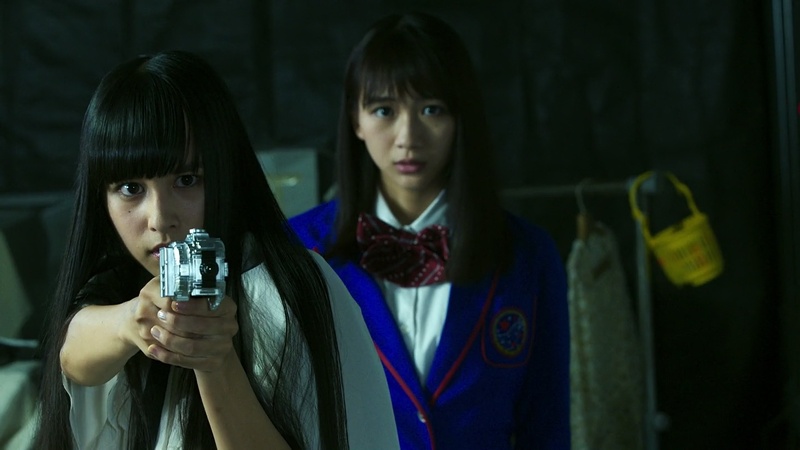 Another Fourze has the first victim and absorbs her into a Core Switch. 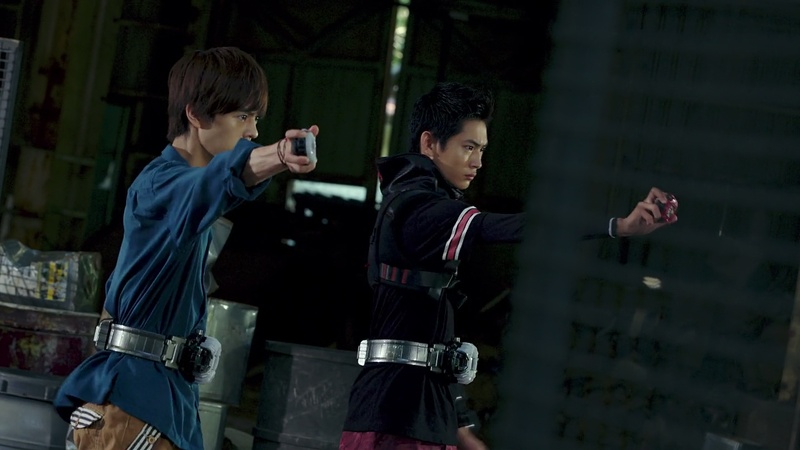 Just then, Sougo and Geiz arrive and they henshin. They battle, but Another Fourze is very powerful, even against Geiz using Drive Armor. 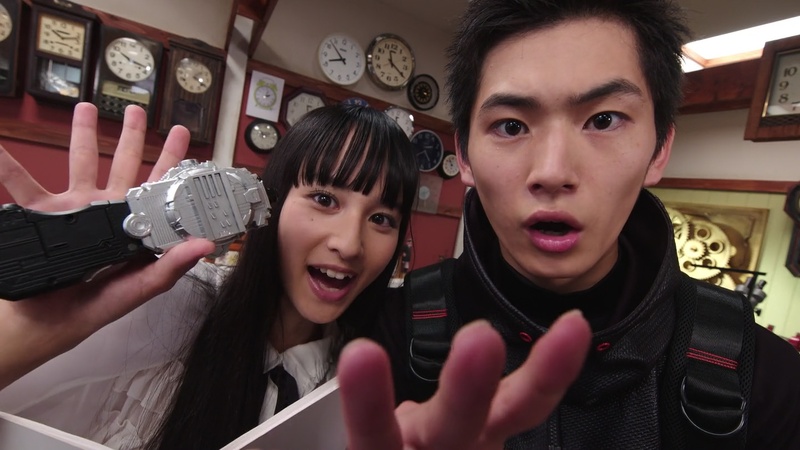 Sougo decides to use the Fourze Watch, but Another Fourze tries to stop him before he can lock it in. 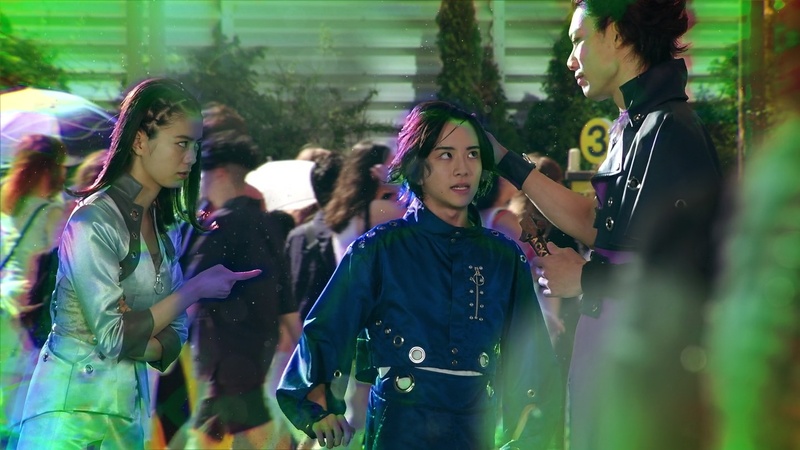 Woz appears, upset that anyone would interrupt his King’s acceptance of another legendary Rider’s power. He uses his power to hurl Another Fourze back, allowing Sougo to lock the Watch in and accept Fourze Armor for the first time. Back in 2018, Tsukuyomi finds Karin in an abandoned building and tries to explain the situation to her. But before they can escape, Masato appears. Tsukuyomi whips out her phone-turned-blaster and points it at him. Masato says he will not let her get in the way. But another man suddenly appears and attacks Masato. In 2011, Sougo grabs Another Fourze and they rocket into space where Sougo uses a Space Rocket Tailspin Kick that seems to destroy Fourze for good. But Sougo and Geiz are shocked when they see Another Fourze’s outer shell break off to reveal Another Faiz! In 2018, the man who has attacked Masato is Inui Takumi… Kamen Rider Faiz! Geiz wonders why Another Rider appeared inside Another Fourze. Sougo points out that each Another Rider has their name printed on their bodies and they remember it was “FAIZ”. Geiz says he’s never heard of a Kamen Rider Faiz before. 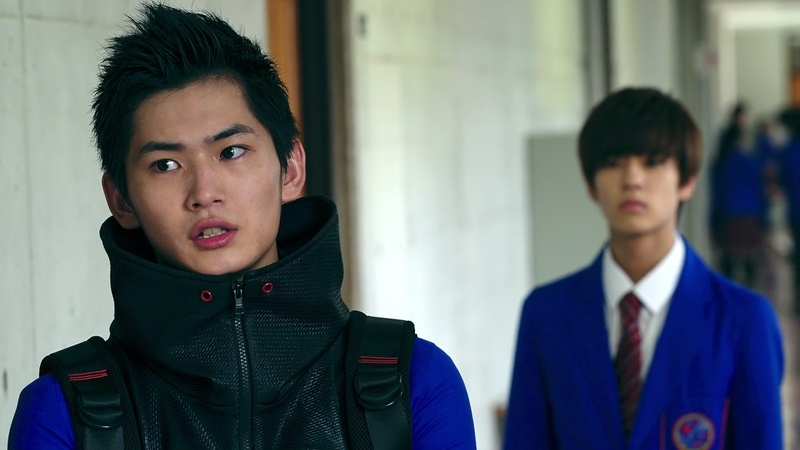 Sougo tells Geiz to call Tsukuyomi down from upstairs using his phone. Sougo says their gadget is pretty handy. Geiz and Tsukuyomi put on a home shopping show to describe the Faizphone X. It allows you to call people in other time periods, which is convenient for time travelers like them. It is a watch that becomes a phone and also a blaster. Geiz and Tsukuyomi still have never heard of a Faiz before even though they use a Faizphone. Sougo thinks that doesn’t make any sense and viewers would never fall for that. Geiz points out Tokiwa Sougo is named after Tokiwa-sō, where Ishinomori Shotaro once lived and is considered the birthplace of Japanese manga. Sougo says it’s only a coincidence their names are similar. But Geiz says viewers wouldn’t fall for that. Tsukuyomi, however, insists Faiz and Faizphone are not related at all and she and Geiz win the argument. So this was definitely an interesting episode. And a big part of that is definitely because my Kamen Rider experience only goes as far back as OOO with a little of Decade. So I definitely had to do a little bit of research on Faiz. But I think I get the gist of what this two-parter might be about. As we see Sougo thinking about friends and friendship, Fourze and from what I understand Faiz would certainly fit that theme. Obviously, it was a huge accomplishment getting Sota Fukushi for the movie. So I definitely wouldn’t expect him back for the series. 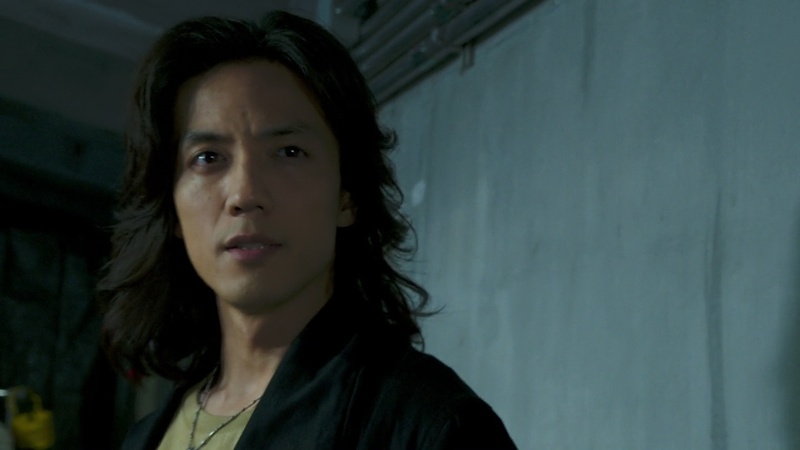 At the very least we got Takushi Tanaka back as Ohsugi-sensei. And it would appear Faiz‘s Kento Handa and Kohei Murakami are the main focus for this two-parter. Funny enough, the actress Erina Mano is now also starring with Sota Fukushi and Ryo Yoshizawa in the live action Bleach which I just watched a week ago and is pretty good. So after Bleach and seeing Sota and Ryo together again, I’ve been missing Fourze a little bit, so it’s nice to have this episode now. 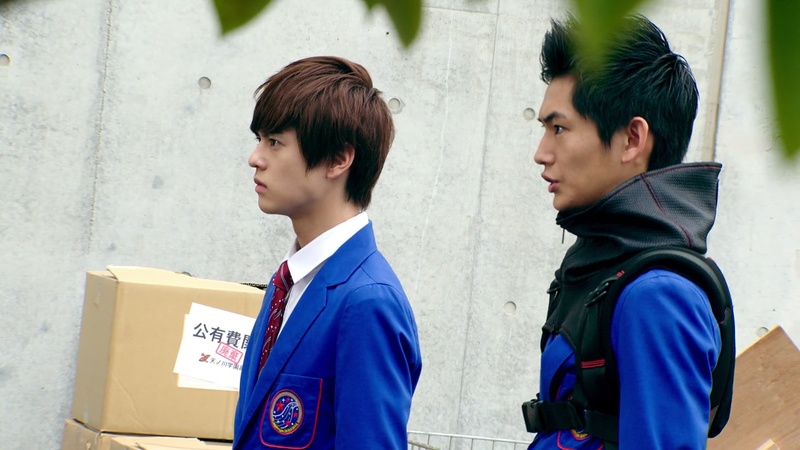 I definitely enjoyed seeing Sougo, Geiz and Tsukuyomi in those familiar blue Amanogawa uniforms. We also get to meet the third Time Jacker. And it was very interesting to see that dynamic between the three. It’s always nice for the villain group to have interesting dynamics as well. It helps add to their motivations and gives them something more to do than just throwing out monsters every week. I also enjoyed seeing Woz in action as well. Hope we see more.